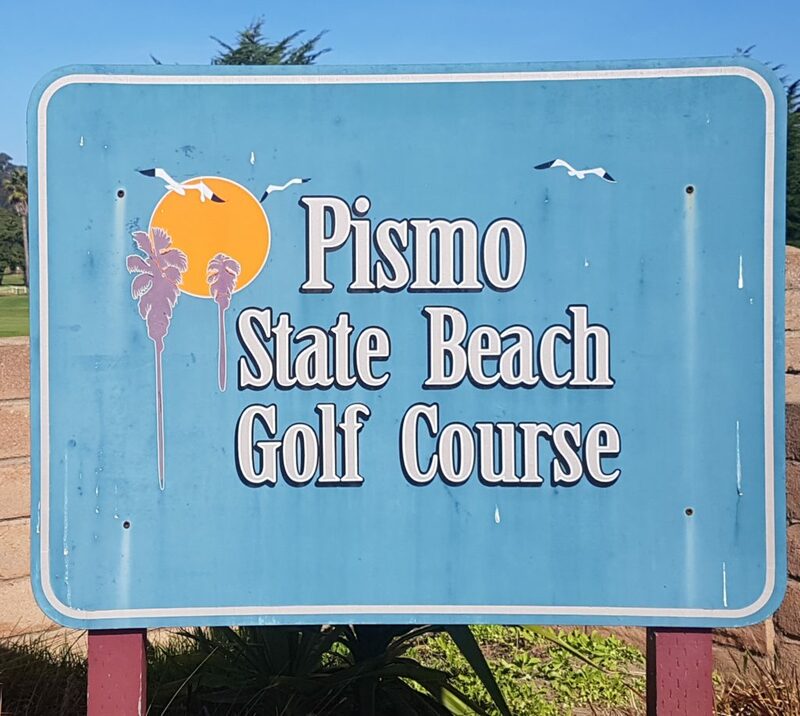 Home Course features Pismo Beach State Golf Course & Where Bugs Bunny Goes On Vacation To Play Golf. Pismo Beach State Golf Course & Where Bugs Bunny Goes On Vacation To Play Golf. 4 months ago by Bernie McGuire Comments Off on Pismo Beach State Golf Course & Where Bugs Bunny Goes On Vacation To Play Golf. 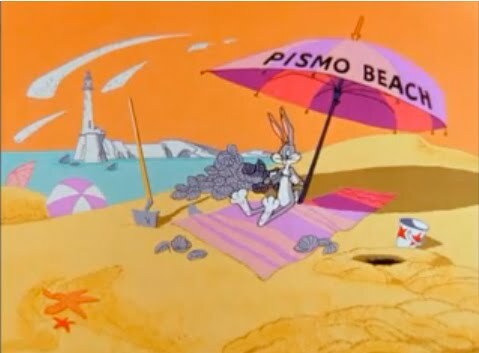 Whenever I hear the name Pismo Beach I bizarrely recall a famed Bugs Bunny cartoon. It all began with a comment by long-time great friend, Joe Sroba. Joe and I were on a first trip to the States and in travelling down the West Coast it was planned we’d stop and visit Pismo Beach. “Why do you want to stop at Pismo Beach”, I think I recall saying to Joe. Joe responded: “That’s where Bugs Bunny went for his holidays. He turned left at ‘Albercorkie'”. Bugs Bunny enjoying clams as he relaxes on Pismo Beach. Okay, what is this Bugs Bunny connection all about I hear you ask? In the Looney Tunes cartoon “Ali Baba Bunny,” Bugs and Daffy Duck are headed on vacation. Bugs leads the way burrowing west but inadvertently he and Daffy take a wrong turn and they find their way inside a secret treasure cave. Bugs, who was expecting to end up relaxing along the shores of the famed Pismo Beach eating clams, emerges from the earth to remark: “Well, here we are, Pismo Beach and all the clams we can eat”. The duo emerge not on sun-splashed Pismo Beach but in an Aladdin’s cave with chests full of gold coins, diamonds and jewels. Realising he and Daffy are inside a cave, Bugs scratches his head saying: “We should have turned left at Albercoikie (Albuquerque) and a right turn at La Jolla”. What unfolds is Daffy letting greed get the better of him but then finds himself being chased by very large guardian of the cave brandishing an even larger sword before Daffy also incurs the wrath of a genie in a lamp he finds in the cave. The world’s most famous ‘rarebit’ eventually makes it to Pismo Beach and is seen relaxing under a beach umbrella enjoying his clams before being joined Daffy, albeit in a comically now shortened state thanks to the genie. It’s for this reason, and with memories of ‘Ali Baba Bunny’, I found myself heading south in the days immediately following this year’s 2018 AT & T Pebble Beach Pro-Am south to Pismo Beach and the 9-hole Pismo State Beach Golf Club. The name Pismo comes from the Chumas language word for tar, ‘Pismu’ which was gathered from tar springs in Price Canyon near Pismo Beach. 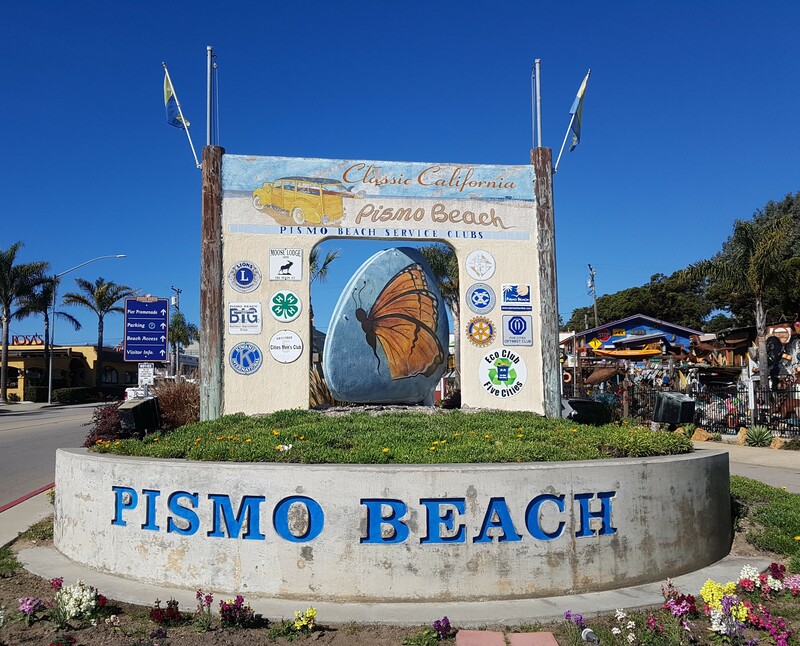 Pismo Beach prided itself from 1950 as the “Clam Capital of the World”, though this motto is no longer used. The city still holds the Clam Festival every October, complete with calm chowder competitions and a clam-themed parade. 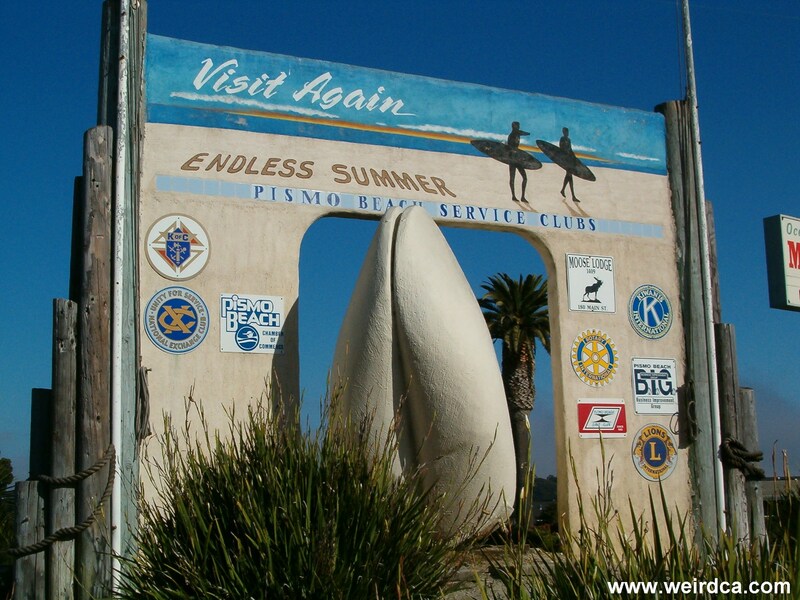 At the southern end of Price Street upon first entering Pismo Beach, a gigantic concrete clam statue greets visitors. The oldest Surf Shop on the Central Coast (Pismo Beach Surf Shop) is seen from the Pismo Clam. There’s an eight-inch shell of the Pismo clam is on display at the Pismo Beach Chamber of Commerce. While Pismo Beach may have been a choice of holiday destination for Bugs and Daffy it’s certainly not one of the golfer’s ‘must-play’ map. 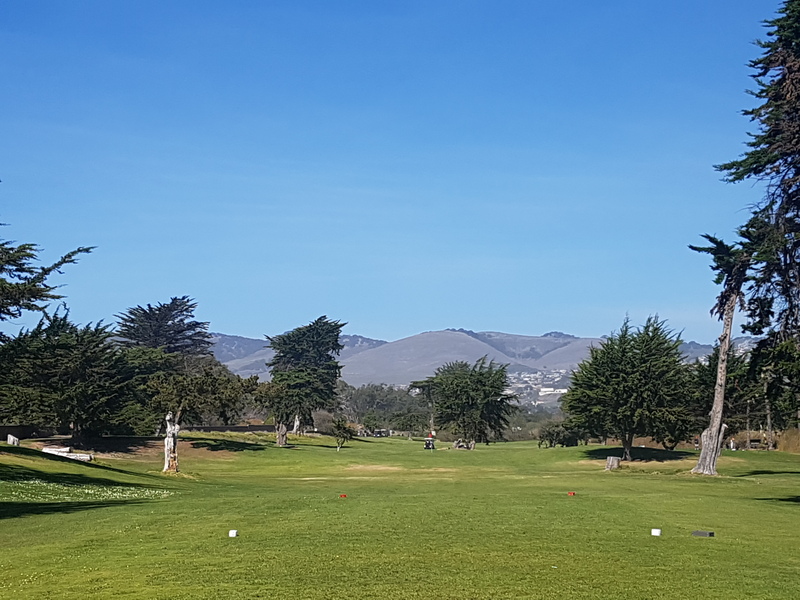 Though there is a nine-hole course laid out along the gleaming Pacific Ocean shoreline that for anyone who is visting the area you should play, if just for the fun of it. It’s not Pebble Beach. 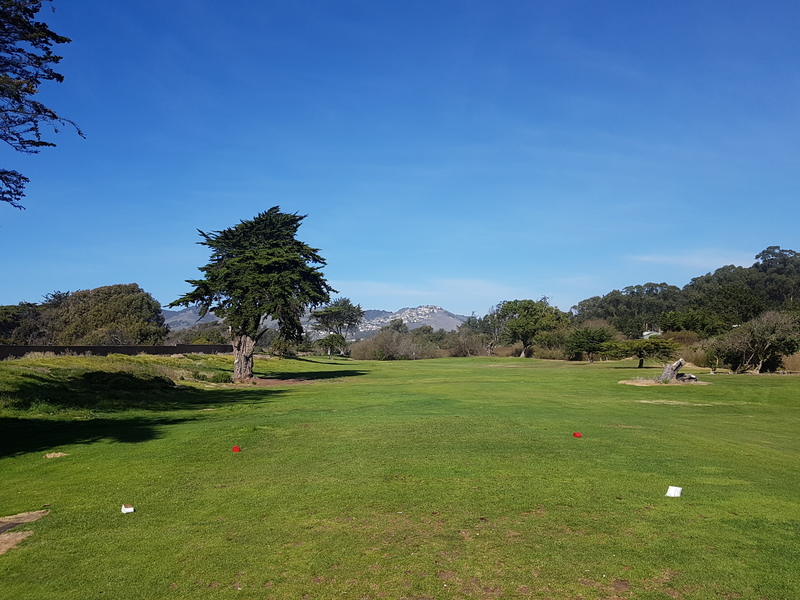 It’s not Spyglass Hill and it’s not the nearest 18-holes located at Avila Beach and about a 10-minute drive to the north and within San Luis Obispo Bay. No, Pismo Beach Golf Club is nine par-3s ranging from the 165-yards at the first, 220-yards at the 2nd, 135-yards at the third, 115-yard at four, 160-yards at five, 110-yards at six, 160-yards at seven, 180-yards at the eighth the last measuring 190-yards. 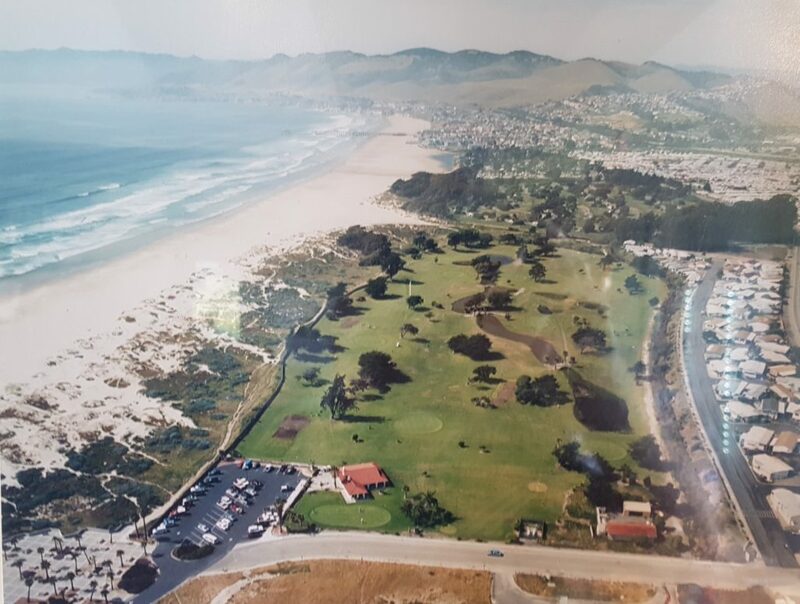 It is understood the course was opened in 1966 when the prominent local Le Sage family purchased several hundred tons of top soik and with the vision to construct a brand new executive par 3 golf course on 29 pristine acres next to the sand dunes of Pismo Beach. The state of California purchased the golf course after a few short years and in 1992 entrusted its management to the current concessionaires. So if you want low green fees and you want to see the ocean on the entire front nine which is the back nine, because there are only nine here, you will feel like you are at poorman’s Pebble Beach, it’s that beautiful. It is stunning to golf on the Beach! I built a house across the street I liked this golf course so much. This Course use to be a duck pond. A little town trivia. A hundred years ago, before Coleman tents were made affordable, people from the valley would camp by the duck pond in their refrigerator boxes, and watch the fireworks on the Fourth of July. Today, we use this Course as a practice course for chipping. It’s quick and fun, and they have reasonable twilight fees. 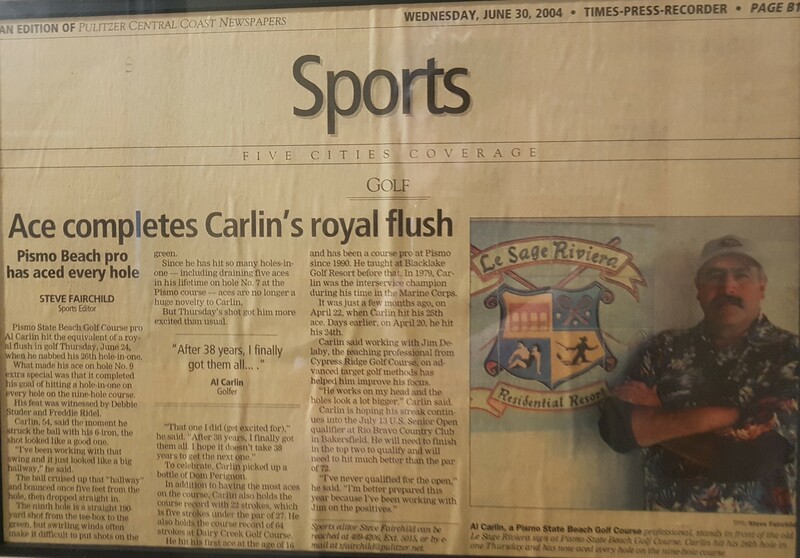 There is also a framed article within the clubhouse of a remarkable feat attained in June 2004 by a former professional at Pismo State Beach Golf course – Al Clarlin. 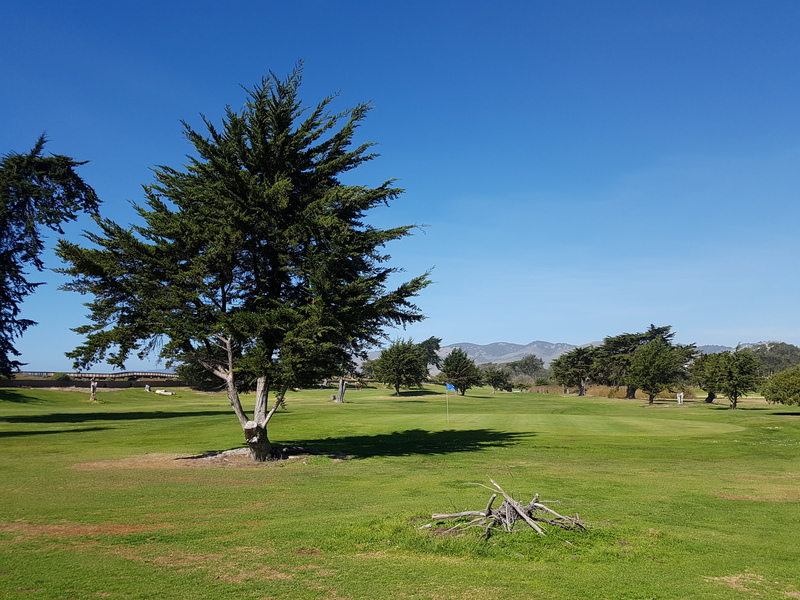 When Carlin holed out with a 6-iron at the ninth hole the then 54-year old not only recorded his 26th hole-in-one but he had the incredible record of having aced all nine holes on the Pismo State Beach Golf course. And he had two witnesses to see his ball drop. Ace completes a 9-hole royal flush in 2004 for then Pismo State Beach golf pro, Al Carlin. And you know the best thing about playing Pismo Beach Golf Club? It’s not just the location laid-out as it is on on the shores of the Pacific Ocean but the rates. On weekdays it costs just $13 for nine holes and that’s increased by just $1, yes $1 to $14 over the weekend. If you are a Senior (62+) or a Junior (16 or under) it’s only $8 during the week and then $9 over the weekend. The club has unlimited golf from 1pm and to qualify you pay the full rate, regardless of age, and that’s $14 weekdays and $15 over the weekend. Now that’s price that would certainly please Bugs or Daffy.